The theme of this month’s Clandestine Cake Club was free as a bird. I have to say, I was somewhat stumped by this and the best I could come up with was a free to make whatever I liked cake. The theme for this month’s We Should Cocoa is gluten free, so that got me wondering. I’d also been sent some coconut oil and coconut nectar to use from Cocofina – review to follow in a later post. Suddenly it all clicked into place and I would do a free from cake – free from gluten, free from dairy, free from eggs and free from sugar (sugar in the everyday sense anyway). Last month’s We Should Cocoa was my inspiration. It included chocolate chickpea cupcakes from Janet over at The Taste Space, which I found rather intriguing. It just so happened that I had a bag of chickpea flour in the cupboard that was waiting for just the right opportunity. This was it, my gluten free cake would be made from chickpea flour. I was also rather pleased with my £1 chocolate cake, so thought I’d go to the other extreme and make a very expensive cake, but one inspired by that one. When I found out that our Cornwall Clandestine Cake Club meeting was at The Baking Bird in Truro, I realised why the bird theme had been chosen. You can see from the picture that other interpretations of the theme were a little more sophisticated than mine. The cafe come bakery was spacious and attractive with a fabulous view of the next door cathedral spires from the upstairs windows. As well as eating far too much cake, we had a quick masterclass in rose piping on cupcakes. I was somewhat miffed that CT did a near perfect one at his first ever attempt at piping, whereas mine was much less successful. Still, at least I got to eat my mistake. To complete the bird theme we tweeted furiously for Cornwall Hour – when cake munching allowed. Thanks go as always to our excellent CCC organiser Ellie Michell for another splendid event. I was a little concerned that the chickpea flour would make the cake overly bitter; it certainly seemed quite bitter when I tasted it raw. Luckily the cooking process transformed it. In CT’s words it was a satisfying cake: rich, filling and not too sweet. The chickpea flour gave it a very distinctive taste, but not an unpleasant one. The coconut flavour came through and gave the cake a certain unctuousness which prevented it from sliding into 70s wholefood worthiness. Free from egg, dairy, wheat, gluten and refined sugar, this is a rich and flavoursome cake made with chickpea flour - chocolatey and not too sweet. Soak the linseeds in the water for about 5 minutes until the water has been absorbed and it has gone a little jelly like. Cream the coconut oil and sugar until well combined, then mash in the banana. Stir well, then beat in the soaked linseeds. Sieve in the dry ingredients, then add the nectar and vinegar. Stir until just combined. Spoon into a 23 cm cake mould and bake at 180℃ for about 35 minutes when the cake should be risen and a skewer inserted into the middle comes out clean. Turn onto a rack to cool. 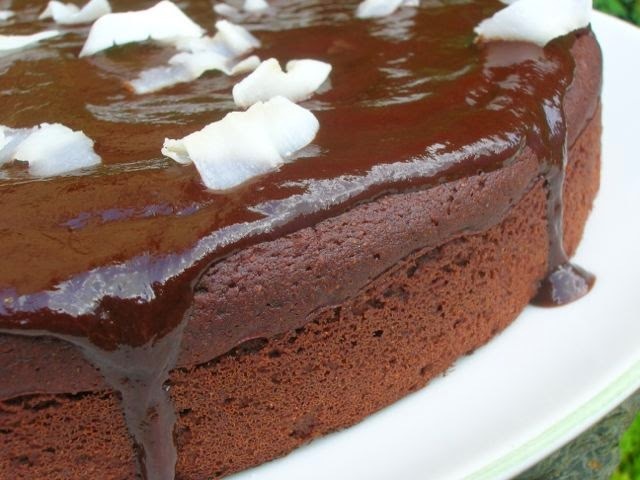 Melt the remaining coconut oil with the chocolate and nectar in a pan over very low heat. Remove from the heat, allow to cool slightly, then pour over the cooled cake. Scatter some coconut flakes over the top. Makes one 23cm round cake. Most of us now know someone who is gluten intolerant so widening our baking repertoire in that area can only be a good thing. Thanks to Michelle of Utterly Scrummy Food for Families for coming up with the gluten free theme and hosting We Should Cocoa this month. You still have over a week to go if you’d like to join in. I’m also entering this into AlphaBakes where the letter is D this month. With my use of 100% chocolate I am going for D for Dark chocolate. Hosted by alternately by Caroline Makes and the More Than Occasional Baker. I’m also sharing this with Helen of Casa Costello for her Bake of the Week. A slice also goes to Lucy of SuperGolden Bakes for her new blogging event, Cook Blog Share. This looks and sounds great! Well done. Being a free-from cake I will happily spread the word! That’s d for very dark chocolate then? or would that be v! lol looks delish either way! oh wow that looks great. Would have never thought of using chick pea flour but it’s such a good idea, well done. I am going to send this link over to my other half and daughter, it’s my birthday in a few days and now I want this cake! Never even thought of using chick pea flour, how interesting. Goodness, there’s a slightly puzzling theme! I always enjoying hearing and reading the different interpretations of a CCC theme and I’m sure this recipe will have many hits with so many people wanting to find great free from… recipes. Lovely cake, coconut is everywhere just now. Love those iced rose cupcakes, beautifully done. What a gorgeous cake! I’ve never baked with chickpea flour so I am intrigued about the flavour. I’ve also never used 100% chocolate – is it really bitter? This is a great cake for the CCC theme. Thanks for entering AlphaBakes. This looks fantastic. I’ve tried baking with chickpea flour too and it can give quite a dense earthy flavour, although nice. I bet the cocoa flavoured was great, looks so rich. Thanks Katie. That’s a very good point abut malt vinegar and not one I’d thought of. I’ll change the recipe to cider vinegar. I never ceased to be amazed at your creativity! Who would have thought of a chocolate cake with chickpea flour! I can just about bake an ordinary chocolate cake so this takes me into new territory! Great cake! I love the use of the various coconut products. 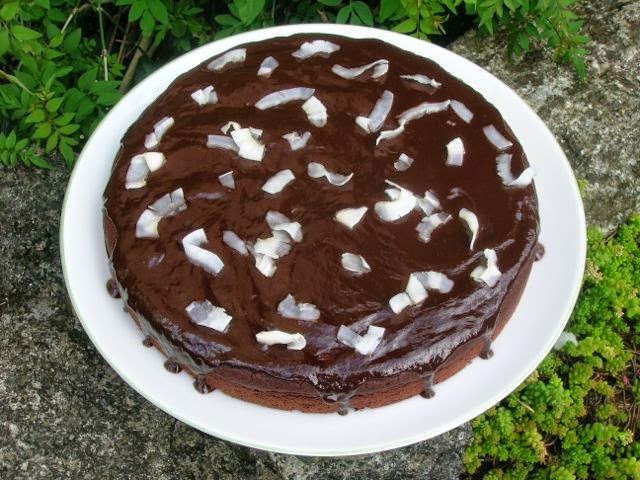 Coconut is so versatile and always adds a bit of extra decadence when not using dairy…….. Yum! What a great use of chickpea flour! The cake looks really super. what a stunning cake… had never ever heard of chickpea in a cake before but makes total sense… you are so clever! I must say when I read the description I was a bit baffled but having now read the recipe this sounds fantastic. I love using coconut oil in baking it gives such a lovely fragrance. Thanks for linking to #CookBlogShare. I would never have thought to use chickpea flour in a cake! But then, I did make a tahini cake so I don’t know why I’m surprised it was so good! Well done for making such a ‘virtuous’ cake free from so many ingredients but still managing to include chocolate as well! Thanks for entering Alphabakes.